The principal behind Wheels of Fire is Davide 'Dave Rox' Barbieri, a student of Michelle Luippi (Vision Divine, Killing Touch). 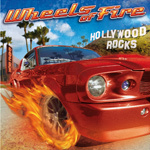 His vision for Wheels of Fire's debut release Hollywood Rocks is, from the title, the classic melodic hard rock from Eighties Hollywood, Sunset Strip, and Whiskey-a-Go-Go, et al. Does he nail it? Now, there's a loaded question. Barbieri and Wheels of Fire can by heavy like that day as on The Reason and What I Want. However, the signature feature of the Hollywood rock was gritty, sneering, sleazy rock with a strong measure of rock n roll rebellion. I don't hear it here. Barbieri is an astounding vocalist, yet lacks the gutter, gritty, and sneering performance of the masters like Vince Neil or Brett Michaels. Wheels of Fire is less Motley Cure or Ratt and more Brother Firetribe, heavy but not so dangerous. Even when they rock, Wheels of Fire seems polite. Hey, I'm okay with it. Hollywood Rock is solid melodic rock, but it's no that whiskey soaked, near heroin overdose, music that made the Sunset Strip famous. Solid and imaginative melodic rock with a sometimes heavier edge, yes. Strict Eighties Hollywood rock, maybe. Worth your interest, positively. Solid and imaginative melodic rock with a sometimes heavier edge, yes. Strict Eighties Hollywood rock, maybe. Worth your interest, positively.